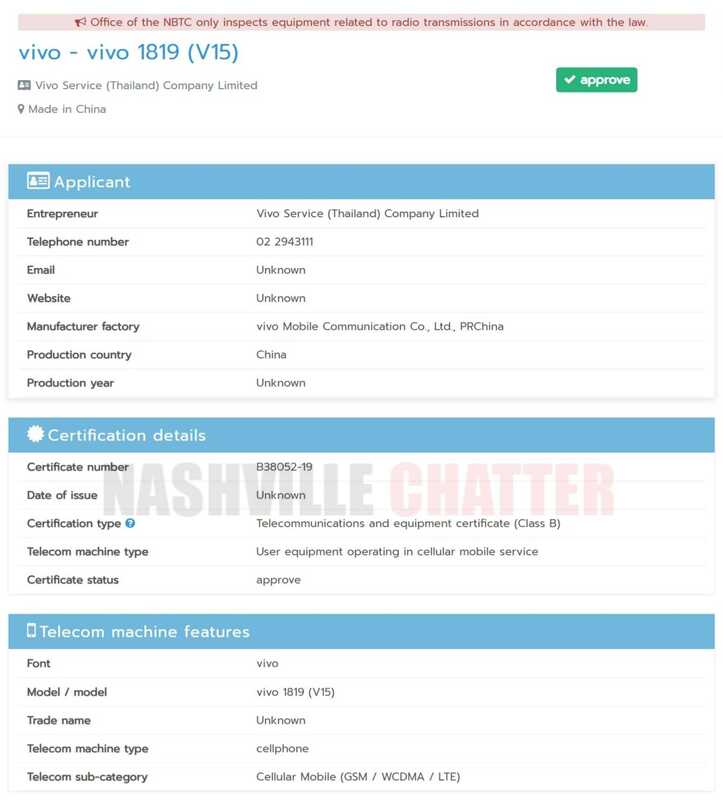 The Vivo 1819 model number belongs to the upcoming Vivo V15 smartphone. This has been confirmed through the NBTC certification of the smartphone in Thailand. The Vivo V15 smartphone is expected to get unveiled alongside the Vivo V15 Pro smartphone on February 20 in India. Vivo 1819 smartphone was spotted first in December 2018 when it was certified by Eurasian Economic Commission (EEC) in Russia. In the same month, the smartphone had appeared on Geekbench benchmarking platform with key specs. The Geekbench listing of the phone had revealed that the phone features MediaTek Helio P70 chipset, 4 GB of RAM and Android 9 Pie OS. The Geekbench listing of the Vivo V15 Pro (model number Vivo 1818) that had surfaced earlier this week had revealed that it is powered by Snapdragon 675 chipset, 6 GB of RAM and Android 9 Pie OS. Hence, it appears that the non-Pro variant will be arriving with a different chipset and less amount of RAM. Since the Vivo V15 is expected to debut alongside the V15 Pro handset, it is likely to feature the same notch-less display and pop-up selfie camera. The V15 Pro will be featuring an in-display fingerprint scanner. Probably, the non-Pro model will lack support for it. The V15 Pro features a triple camera module on its rear. There is a possibility that the V15 may only feature dual camera setup. The Vivo V15 Pro is expected to feature a 6.39-inch display that produces full HD+ resolution. The triple camera setup on its rear is expected to feature 48-megapixel, 8-megapixel and 5-megapixel sensors. A 3,700 mAh battery is expected to power the handset. The device is likely to carry support for dual-engine fast charging. Before getting unveiled on February 20 in India, the Vivo V15 and Vivo V15 Pro are expected to be available on pre-orders from February 15.